Nemo came to us in dreadful condition. He was found as a stray and taken to East Valley shelter in Los Angeles. The shelter thought that he was about 5 months old, and he weighed just 27lbs. When shelter staff called to tell us just how sick this little guy was, we knew we had to save him. Alley pulled him from the shelter and drove him straight to the vet. Mange had spread over his entire body and into his eyes. His skin was on fire, he smelled horrible, he cried all the time and he was miserable. The vet estimated that he had been in that condition for 2 to 3 months, and he was only 5 months old. We began treatment immediately, painful skin scrapings, medicated baths, antibiotics, eye meds, he stayed in medical boarding to give him chance to heal quickly and safely. The vet staff loved him, his sad story had melted their hearts so little Nemo got carried everywhere and spoiled rotten during his time in medical care. His road to recovery was a long one, skin scrapings, ointments, medications, baths, special diet...but during all of this, Nemo was such a trusting and loving little guy. He just wanted to be held and cuddled and sleep on your head! Nemo got his very own forever family in July 2012. 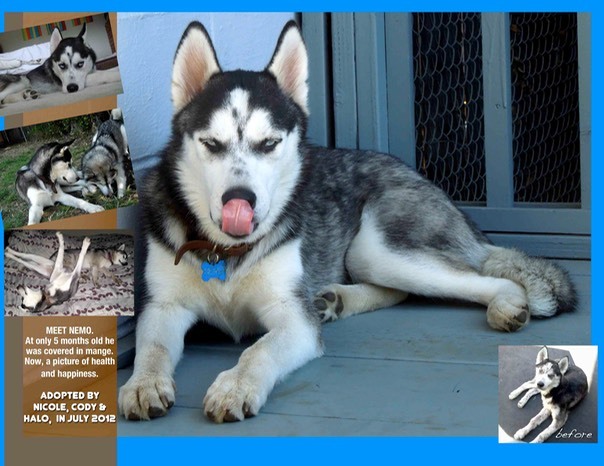 He was adopted by Nicole and her feisty female husky, Halo. It was love at first sight for Halo! Nemo is now a bundle of health and happiness, although we are told that he still likes to sleep on heads.